Alan Langford is a freelance artist and illustrator who specialises in equestrian subject matter. A member of the Society of Equestrian Artists; the painting of horses is an occupation he finds both enjoyable and rewarding. He describes himself as a painter of horses in their natural or working environments, rather than specifically a landscape painter. He began his artistic career in 1979, working as a full-time illustrator for “Etchmasters” of Alresford, illustrating topographical scenes in pen and ink, which were transferred on to copper plaques. After three years at “Etchmasters”, Alan went freelance working through a Fleet Street artist agency, illustrating comics, book covers and fantasy game books. Since then Alan has illustrated history books, encyclopaedias, adventure stories, myths and legends. He has worked for B.B.C. Television, illustrating the stories of “Romulus and Remus” and “Androcles and the Lion” for the popular children's programme “Zig -Zag”. He has also worked as an art tutor in adult education, and is frequently asked to demonstrate his drawing and painting techniques for amateur art societies, the W.I. Etc. Currently he works mainly as an equestrian artist, painting horses and ponies in the open tract of the New Forest or Dartmoor in Devon. His love of riding and horses has aided him in depicting these remarkable animals with empathy, vigour and movement. A fascination for Romany’s and their horse fairs has exerted a powerful influence on his paintings. In the summer of 2012, he was invited by Tim Craven, curator at Southampton City Art Gallery to exhibit one of his large oils in the exhibition entitled “Nags to Thoroughbreds”. 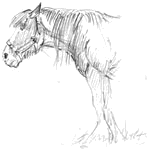 The exhibition ran from September 2012 until February 2013 and featured the galleries entire equestrian collection, which included the work of Sir Joshua Reynolds, Sir Alfred Munnings and Lucy Kemp Welch.